In each of the books in the Southern Vampire Mysteries the title of the book will tell you what to expect in the story. This time around “Dead in the Family” hits the nail on the head. It seems as though every character major and minor ever mention in the series has a family problem in this one. With all this happening the future is pretty much unsure, the Shreveport, La. werewolf pack is under pressure from the government to get registered, and the government is just looking for a reason to lock up all two natureds. Alcide Herveaux, leader of the pack asks Sookie’s permission to have the monthly pack run on her land since his is being watched. When the run is over Sookie is told that there have been fairies running around her land recently and a dead body. One of the fairies can be explained in that Sookie’s cousin and full fairy, Claude has moved in with Sookie because he needs to be near someone like him, even if she’s only 1/8th fairy. 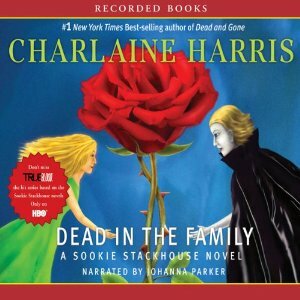 The dead body is that of Debbie Pelt, Alcide’s former girlfriend, whom Sookie killed. The other fairy scent, needs to be explained. Eric & Sookie’s relationship seems to be building, at least until Eric’s maker shows up with his latest progeny, Alexei Romanov, only son of the last Czar of Russia, who as an adolescent witnessed the Bolshevik Revolution, including the slaughter of his entire family. Alexei seems to be bordering on the brink of insanity (who could blame him?). Eric returns to Shreveport, but not before sending a tracker to find out who the other fairy may be. This tracker discovers another body. This second body is new and has been buried on Sookie’s land to frame her for murder. Who is this other body? Who killed them? Why is Sookie being Framed? All these questions get answered and but they don’t solve anything. This just creates more turmoil in Sookie Stackhouse’s life.